Seminarium - Commentarii pro seminariis, vocationibus ecclesiasticis, universitatibus et scholis catholicis. Back issues of Seminarium, quarterly magazine of study for the superiors of seminaries and religious institutes. Original texts in Latin, Italian, French, English, German, Spanish. 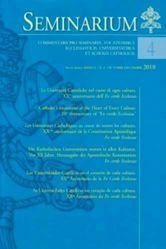 Starting 2016 the magazine name changes to "Educatio Catholica".